Having had an easy Saturday, we wanted to get out and explore France. 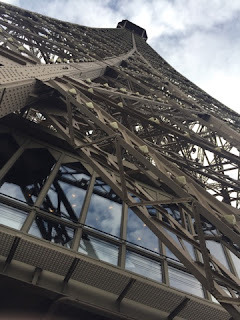 We knew that we wanted to visit Paris, and we had heard that smaller towns can be quite sleepy on a Sunday, so we decided to head to the capital. Not really having a clue about the best way to travel into the city, we did a quick search for local trains into the centre, knowing that the worst case scenario would be that our little boy had an opportunity to go for a train ride. Our site reps from Eurocmap suggested going to either Soissons or Compiegne to catch the train. With wifi / internet access being temperamental at best, we finally found that Compiegne appeared to have the more frequent services. It was a short drive of about 30 minutes into the town and there was plenty of parking available (even if I did initially park in a short stay space). We queued up for what seemed an eternity, watching as the train we planned to catch left the station, fortunately there was a second train 20 minutes later, but the fun and games at the ticket office meant that we still only just caught that one. It felt exciting getting on a double decker train as we don't have them in Britain, but we still defaulted to sitting on the lower tier near an exit, next to a window so we could watch the world go by. After three or four stops, we made it into Gard du Nord. We were greeted with seeing a building that protruded from the pavement at an angle and an angel with wings, but on the other side of the road there were signs of the shrinking corporate world we live in, Starbucks, Burger King and McDonalds all within a short distance of each other. We headed south, as all the tourist attractions we wanted to visit all required us to head in that direction. It was only after a quite a few metres that Nikki pointed out that it was lunch time and she really want to eat at the Hard Rock Cafe. This meant walking in completely the opposite direction. It did however meant that we got chance to experience some of the small alleys and the buzz that goes with them. There were numerous cafes and brassieres with people sat watching the world go by, it looked idyllic. I did have a laugh to myself with all these wonderful looking cafes, we still decided to go for an American lunch! One thing that did strike me was the cigarette culture that still seems to exist in France, where it is more popular, perhaps it's because we saw so many people outside at these cafes, but there seemed to be a lot more smokers in France than there is in the uk. We finally arrived at the Hard Rock Cafe after about an hours walking to find there was a 30 minute wait for a table, we took our alerting device and got some drinks at the bar. 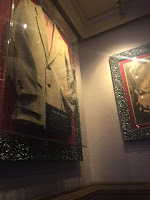 It was my first experience of a Hard Rock Cafe, and I can see myself going to others in the future. We were sat next to William.i.am's jacket at the bar as Metallica played over the speakers. When our devices started to buzz, we were shown to a table under Frank Zappa's coat and, I think, an album sleeve with him sat on the toilet (each to their own). Thankfully our all the staff seemed comfortable speaking English, which we were grateful for as I ordered a Hickory Barbecue Burger, Nikki a Pulled Pork Sandwich and we ordered pizza and chips for our son. The food soon arrived and we devoured our meals leaving clear plates, except my son, who initially had the most enormous meal in front of him! After settling the bill and buying some merchandise we headed on our way again. The road opposite Hard Rock Cafe took us towards Jardin du Palais Royal and the Louvre, one of the places that Nikki wanted to go to. It felt like another long walk down side roads but we made it to the Louvre - Nikki was in awe. We spent a few minutes taking photos and absorbing the architecture whilst our son had his nap. Nikki also caught her first glimpse of the Eiffel Tower at this point. We headed further south on to a bridge where we could just make out the island which Notre Dame is built on. We thought we may be pushed for time, so we decided to head to the Eiffel Tower. I wish someone had warned me how far the walk was! After flagging down a cab, I asked in my broken French how much the journey would likely be, I was sure the taxi driver said €50, but then said maybe up to €20. I thought it was a risk worth taking to get back as soon as possible. If I'm honest, I'm really glad that we took the taxi as it gave us an opportunity to see other parts of the city, catch a train at a sensible time and we could get back to our car sooner rather than later. It also allowed us to experience Parisian traffic in the hands of a professional! Back at Gard du Nord, and again in my broken French, I tried to find out which platform the next train to Compiegne left from (even if my pronunciation of the towns name was terrible). The second person I spoke to said to just keep watching the electronics boards and soon enough, the train to Compiegne was given a platform. Being the rebels we are, we got on the train and found some seats hoping it was the right one. Bang on time, the train left the station, phew, and best of all we were getting off at the first stop. The only thing was we found that we had been sold tickets for a train shortly after 17:00 and it was 19:15 as we left the station. No one came round to check tickets luckily, I really don't know how that conversation would have ended. Back at the station, we paid for parking - the cheapest part of the day at €4 - and headed back to our campsite. Tomorrow, we are off to Disneyland by car, which I'm sure will be fun for all involved. Until the next post, au revoir!